While I haven't made a ton of physical progress on the layout since my last update, I've been working on the planning side of things a lot lately. That includes everything from the track plan to locomotive paint scheme ideas. I love planning and designing stuff like this so I am having a ton of fun with this whole proto-freelance thing. For whatever reason, I can never leave things like this alone. I haven't even really used the GLN logo for anything just yet and I've already made some changes to it. In my last post I detailed the symbolism contained within it and how the negative space of the two arched lines represented the two main lines. Well, after messing around a bit with the logo design in Inkscape I've decided to simplify it and eliminate the whole negative space idea. Now there are just two arched lines with a thickness similar to the perimeter pentagon. I think this gives the logo a cleaner look overall. The revised GLN logo shown in blue and in white. I've also significantly changed the track plan once again. I've abandoned the idea of having the large wye in the one corner. That means I no longer have the ability to turn a train around, but that's ok with me. I plan on having two locomotives to work this layout, so I will just have one facing each direction. Revised track plan as of November 21, 2017. This update was also about simplifying the entire layout. I have a smaller yard in this case and it is directly connected to the paper mill, so that will make moving cars around a bit easier me. The town area is also a bit simper with fewer roads and more open spaces. I don't want to take on more than I should and this feels about right. Outside of designing the logo and locomotive paint schemes, I think I will have the most fun with planning and building the Hawkins town scene. I've laid it out so there will be a single main street running parallel to the track. This means I only need to build up the one row of buildings and that is probably a good thing for someone like me without a ton of experience building kits. Now I just need to pick one to get started with. As I am searching for structures to use on the layout, the one thing that has not changed is the plan to go with a paper mill as the primary industry on the layout. I tossed around some other ideas, but keep coming back to this so I am going to stick with it for now. I feel like this is something that will fit nicely with my 1990's northern Michigan theme. The plan for this layout is a standalone paper mill. This means the mill will receive it's pulp from outside sources by rail or truck. I feel like I do not have the room to make this an integrated mill and I do not want to over complicate things. Right now I am leaning towards using the Superior Paper Mill kit from Walthers. I really like the Cornerstone kits from them and this one seems like it would work well in the space I have available. An example of what the Walthers paper mill kit could look like. For this paper mill, I wanted to come up with my own name and logo for a Michigan based paper company. While it's not the most original or unique name, I went with "Michigan Paper" for the company that will be represented in the fictional Hawkins, Michigan. Part of the reason I chose this name was the aesthetics of it. When arranged in a certain way, I was able to come up with a neat logo that turns the "A" from both words into part of a tree. The horizontal lines were just filler to avoid empty space in the corners, but they could represent finished sheets of paper. My first attempt at a logo for the fictional Michigan Paper company. Now that I have the new track plan kind of nailed down, I've started laying down some cork so I can give it a good test run. If I am happy with it at that point I will try to work on getting the main line glued down and wired up for my DCC system. That should be a fun little project as I've never wired a layout like this before. Now that it's becoming winter around here, I've been finding myself a lot more motivated to get things done on the layout. I would really like to get the track down so I can get the fun part of building up the town of Hawkins. This first layout update will serve as a recap of everything I've done on the project since late 2015. It will provide some background on the fictional railroad that I've come up with and a general update of the layout as of early 2017. First, a little background on me. I've lived in Michigan my entire life and got into trains at an early age. Part of that interest stemmed from seeing a lot of Detroit & Mackinac trains while at my family's Northern Michigan summer cottage on Lake Huron. Ever since then I've always had a special interest in the D&M and anything related to it. Even now when I'm up there I like to check out the Lake State Railway (successor to D&M) whenever I can. Those two railroads are a good part of the inspiration for the railroad I came up with for this layout. The layout itself is going to be set in early to mid 1990's Northern Michigan. Like some other freelance model railroads I've seen I am going to mix history with a little fiction. In the Michigan I'm going to be portraying on the layout, the fictional Great Lakes Northern Railway is the successor to the Detroit & Mackinac as of 1992. Modeling this time period will be neat because as a transitional period I can use my existing D&M models and they won't look out of place. While it is set in Michigan, I've come up with the fictional town of Hawkins as the main focus on the layout. Hawkins is a typical northern Michigan town located along the old D&M main line between Grayling and Gaylord. There will be a main downtown with commercial and residential areas along with one large industry (TBD, but leaning toward a paper mill right now) and a small rail yard with connections to the main line. Here it is on a 1992 map. Map of Michigan railroads from 1992 showing the GLN lines and Hawkins, MI. As far as the look of this new railroad I've created, I wanted to go with something predominantly blue because that's the color I think of when it comes to Michigan and the Great Lakes. Beyond that I didn't really have any specific requirements. The logo took a little time to come up with, and I probably went through ten or so design concepts, but I'm definitely happy with the results so far. Here is the logo with some of the symbolism explained. My logo design for the GLN. In addition to the logo, I've been working on some locomotive paint scheme concepts for the Alco's that the GLN inherited from the D&M. I tried to keep a balance of something that would be easy to paint onto a model as well as somewhat realistic looking. I ended up with what I would call a hybrid of the D&M and Lake State paint schemes. Below is my latest concept for a C425. Hopefully it will look good on an actual locomotive. My first attempt at a paint scheme for one of the GLN's Alco C425's. I'm actually really enjoying this part of the project. It just makes it that much more fun to come up with these designs myself. I've been dabbling in graphic design for a few years now so it's nice to get to use some of that here. I'm not sure if I will stick with these designs permanently, but they are a great start and I'm happy with how they turned out. A look at the current state of the layout. A look at the current track plan from SCARM. One thing I do need to work on is the center divider structure. Its more of a box shape than a flat sheet, so I just have to make a trip to Home Depot for the lumber to finish it. I had originally wanted just a flat divider wall, but the table was too wide for me to be comfortable reaching all the way to the center. Rather than rebuilding the benchwork, this seemed like a good compromise. Now I just need to build the thing and get it onto the layout. I've also been working on temporarily laying down some roadbed and track to test out my track plan. To do this I've just been pinning the roadbed and track into the foam with 1" nails. Its enough to keep it in place so I can get a feel for my track plan. Now I just need to buy the rest of the track I need so I can really test out the track plan. I don't know when my next update will be, but I'm hoping to at least have some decent progress to show at that time. This is a long term project so I'm not really in any rush to complete it. This blog will focus on my current HO scale model railroad layout, the Great Lakes Northern Railway. It is a proto-freelance layout set in 1990's Michigan. 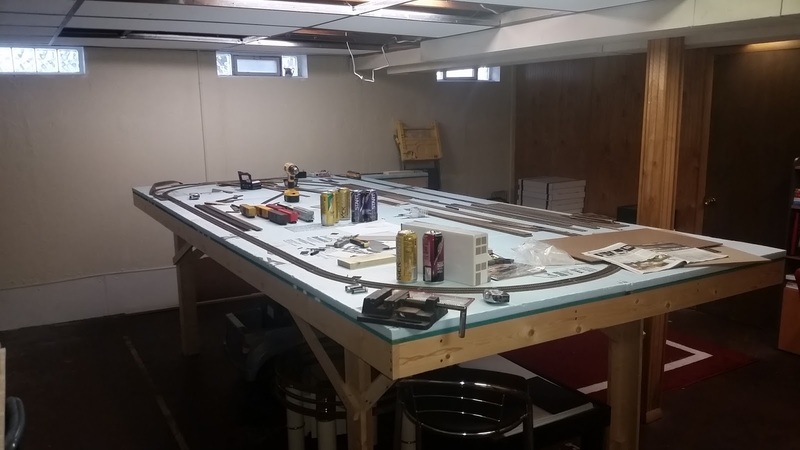 The layout itself is on a 12' x 5 1/2' table in my basement. Construction of the benchwork began back in September of 2015. I will post updates here as I make progress on the layout. The Great Lakes Northern Railway (GLN) is an HO scale proto-freelance model railroad set in 1990's Northern Michigan. The purpose of this blog is to keep track of and share it's progress. Q.R.L.& P.Co. - What can be done? FPS 1218 is on the move!